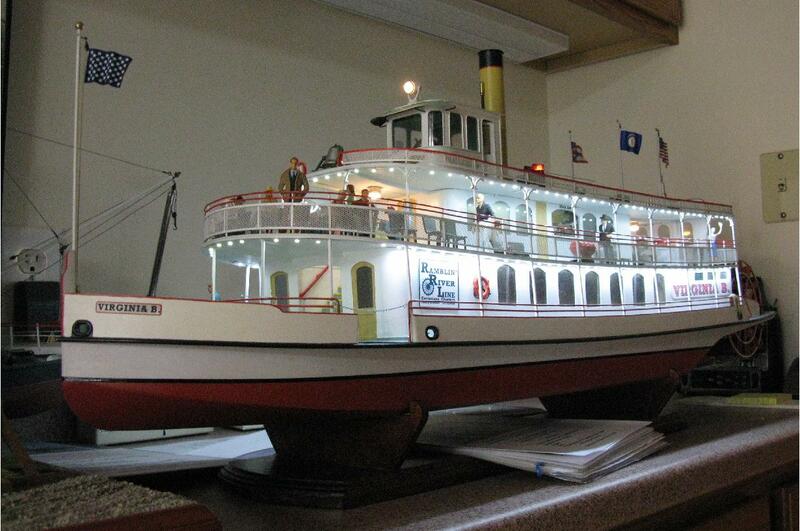 New at the Steamboats.com Online Museum: the Fryant Model Boat Exhibit,featuring steamboat models by John L. Fryant. These first three photos are of my model of the Robt. E. Lee, built for the Mississippi River Museum at Mud Island, Memphis TN. This was the largest model I have built to date, measuring 6 1/2 ft. long. It was built on contract for the museum during a period from the Fall of 1979 until Feb., 1982. Scale is 1/48th or 1/4" = 1'. I used Alan Bates' plans, plus numerous photos in my research. I don't know how many hours I spent on it but it was built in my spare time. Much to my surprise, the model was seen very briefly on the silver screen in the movie"The Firm" - probably for about 5 seconds. It was at the beginning of a chase scene through the museum which took place about two thirds of the way through the film. 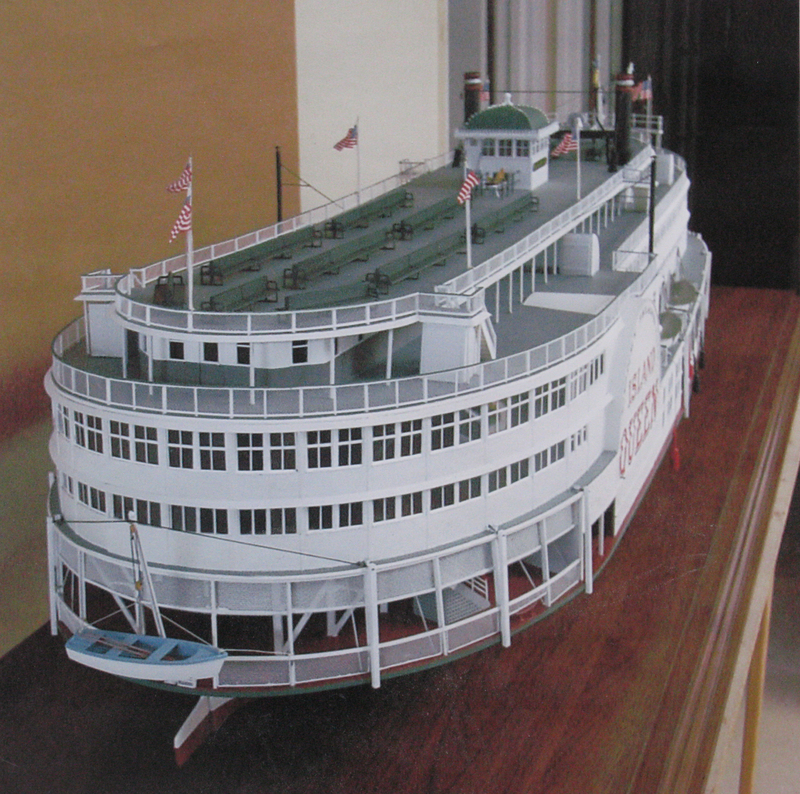 This model of the Island Queen II, Cincinnati's famous excursion boat, was built for Mr. Karl Reik, of Ft. Thomas, KY and depicts the boat as she appeared circa 1930. Scale of the model is 3/16" = 1 ft. The hull is 53 " long. 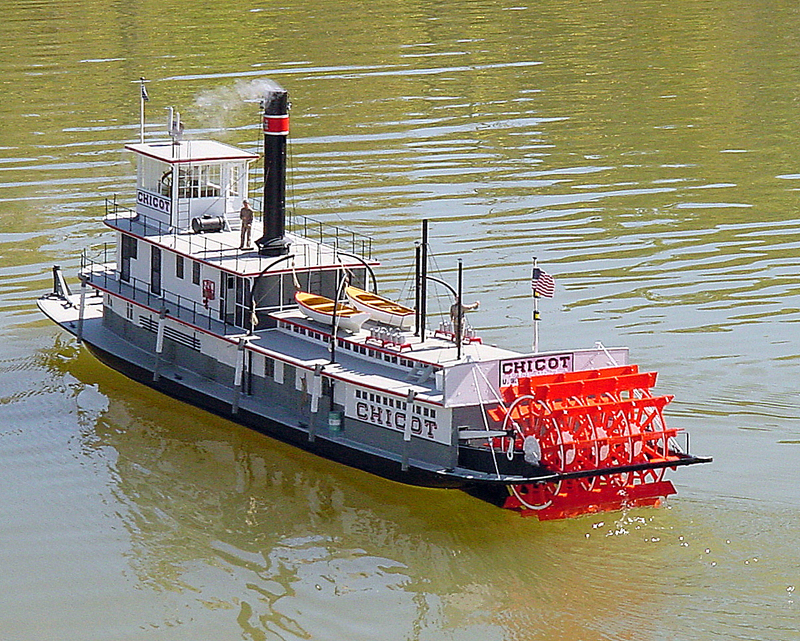 The Chicot was built by the Howard shipyard, Jeffersonville IN in 1925 for the Army Corps of Engineers. 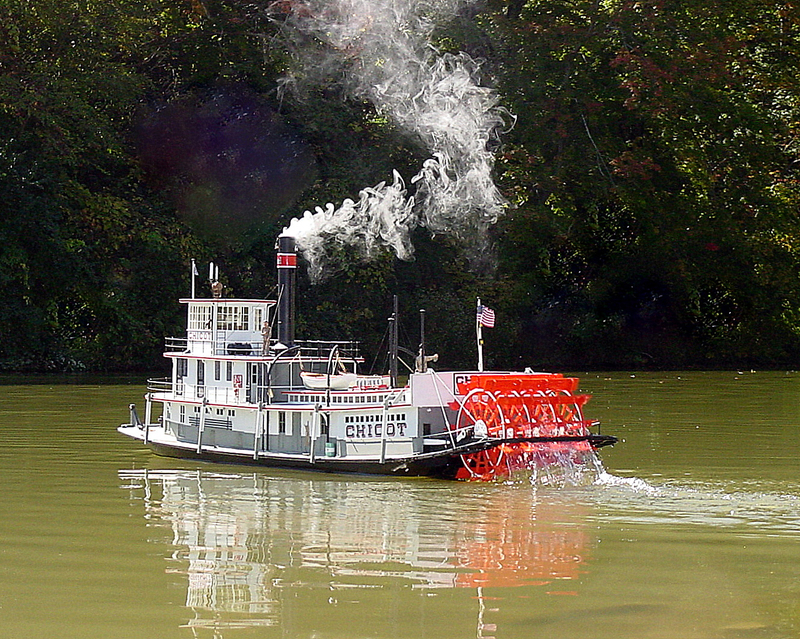 She worked as a dredge tender for the Vicksburg District until 1941 when she was sold to Commercial Barge Line and renamed Jerome D. Beeler. She was again renamed Alec Parnie in 1943. Later sold to Capt. C. C. Stone, Pt. Pleasant, WV. 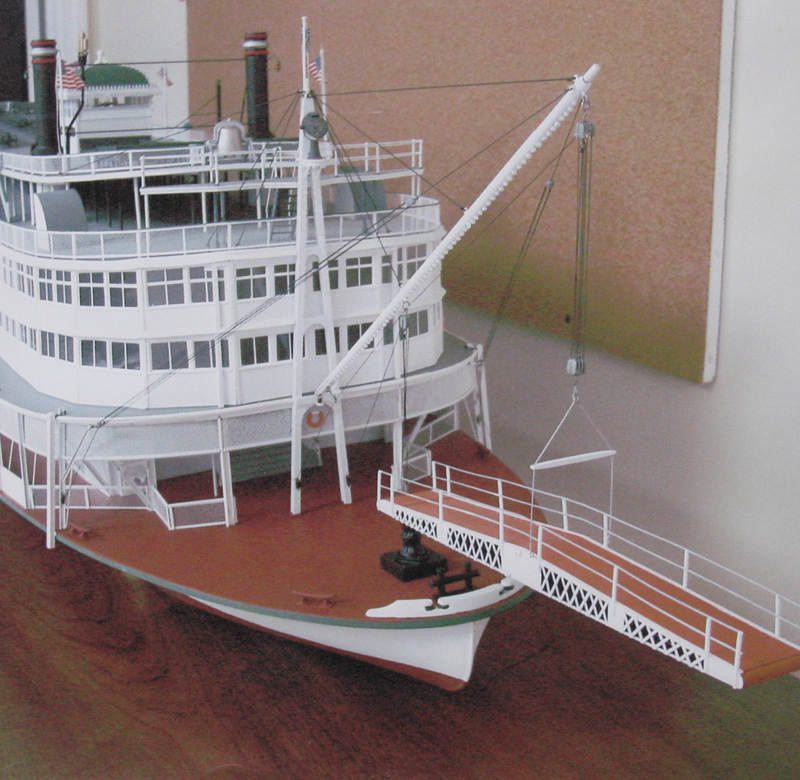 The model is scaled at 1/24 or 1/2 " = 1 ft. It is 53 in. long and approx. 12" beam. It is presently an operating radio controlled model. It is currently for sale. 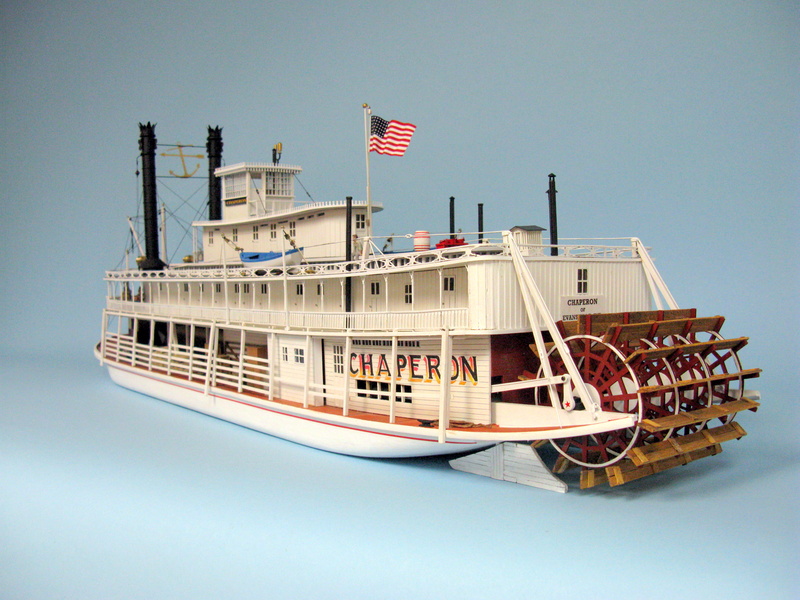 The following two photos show the Chaperon model built for Dave Thomson. This is my most recent model, completed late in 2011. It was built from the recently released kit by Model Expo. Scale is 1/48th. There are a lot of inaccuracies in the kit which I had to correct. The model turned out very well, although it probably looks a lot cleaner that the full size Chaperon ever looked. 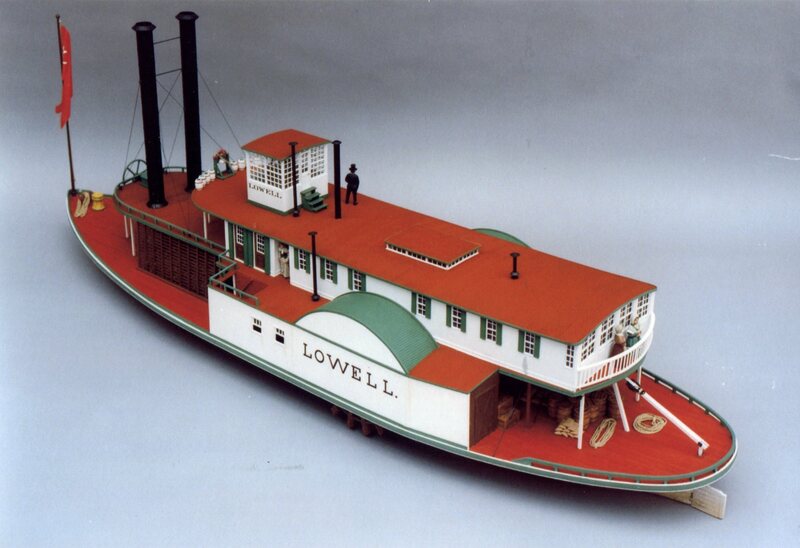 The next two show a model of the Lowell built in 1998 on commission for the Columbus Museum, Columbus GA. 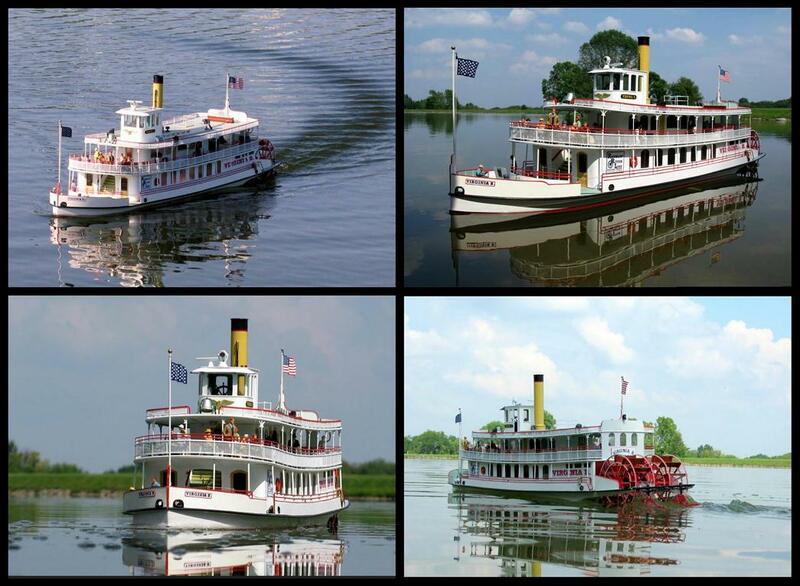 The Lowell was built in 1838 in Jeffersonville or New Albany, IN for use on the Apalachicola and Chattahoochee Rivers. Home port was Apalachicola, FL. 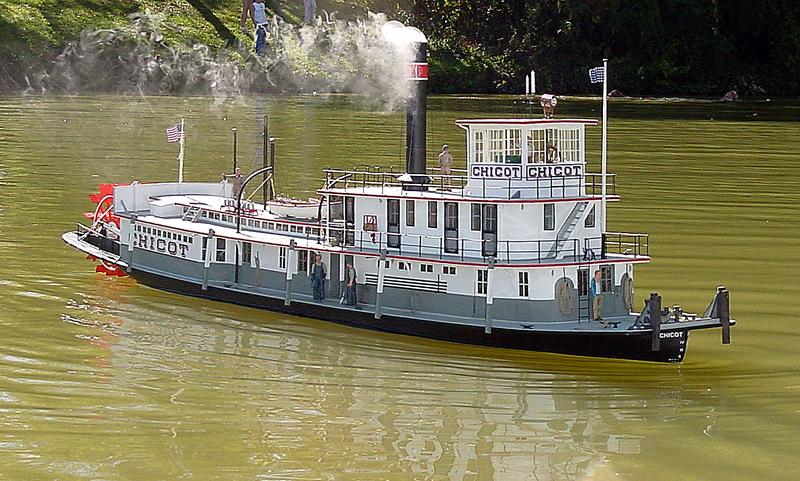 She was owned by coton broker Henry T. Hall and named for the city of Lowell MA. 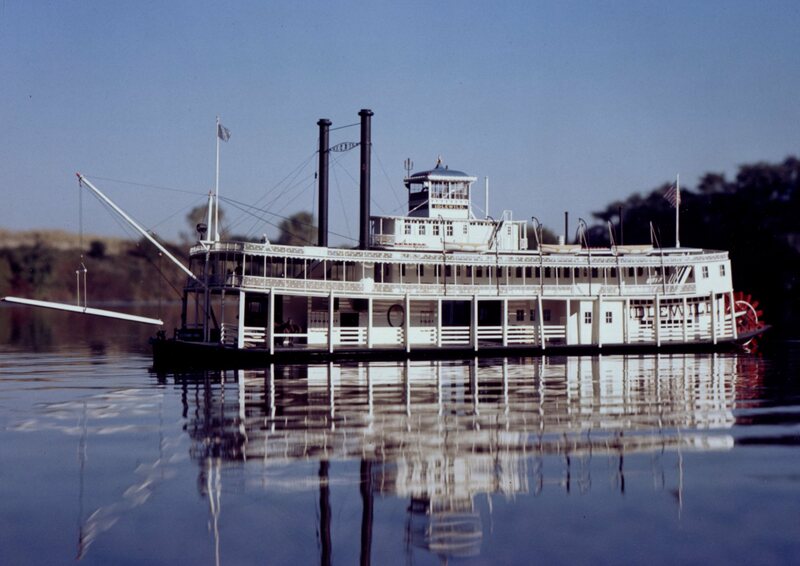 She operated until March 4, 1845 when she was snagged on the Chattahoochee a few miles below Ft. Gianes, GA. The model is built to 1/48th scale from research based on the known hull dimensions (135 ft.) and an inspection certificate. The color scheme is taken from a painting of the boat made in 1843 by an unknown artist. 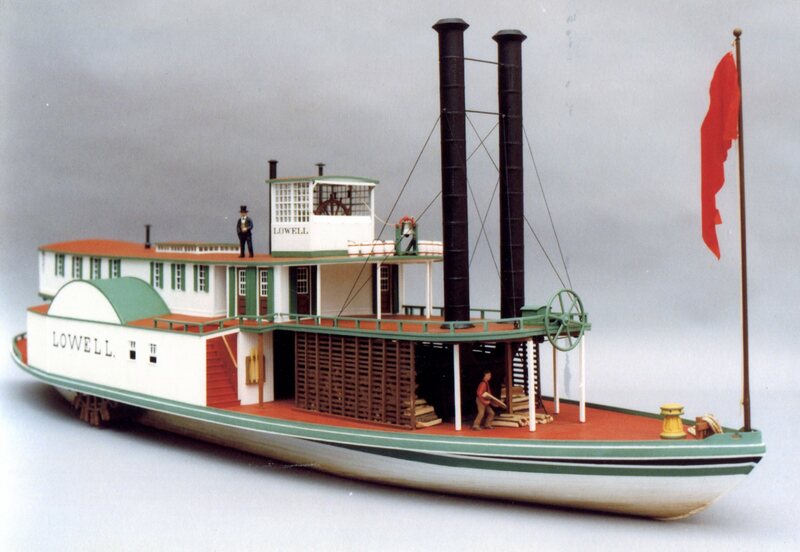 Other drawings and paintings of early steamboats were also used in the research for the model. 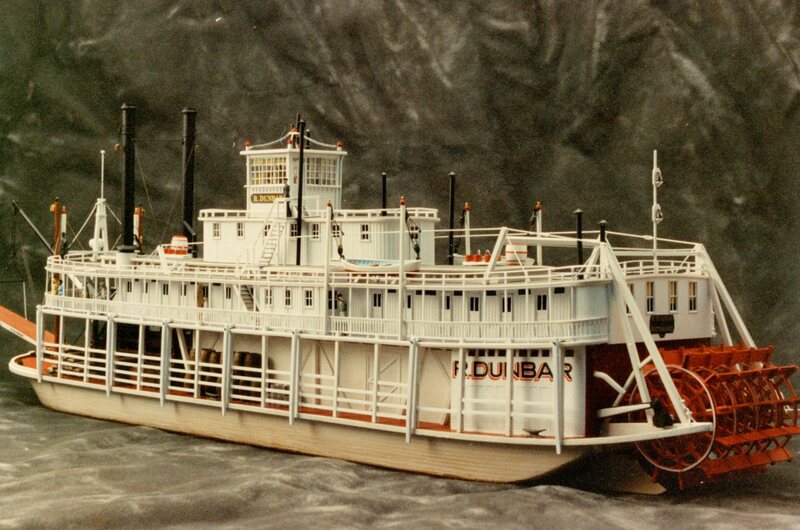 This model of the R.Dunbar was built in 1990 for the Gaylord Entertainment Co. in Nashville, TN. Scale is 1.96th or 1/8" = 1ft. The Dunbar was one of the Packets owned by Capt. Tom Ryman and was used in trades on the Cumberland River above Nashville. 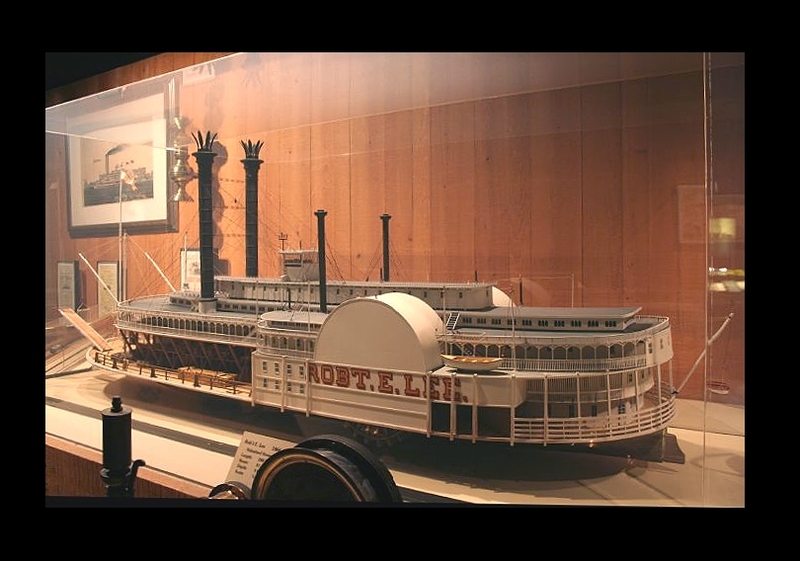 Sold to the Liberty Transportation Co. in 1918, re-named General Crowder and operated on the Ohio R. The model is displayed in the Ryman Auditorium, Nashville, TN. 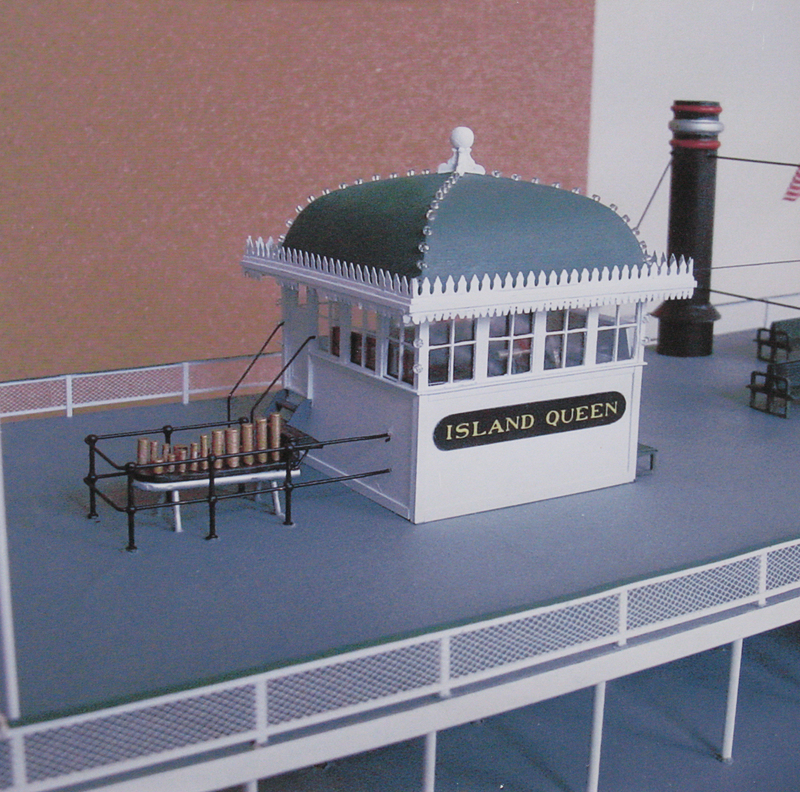 This is my model of the Idlewild, built in the late 1960s for myself. It was originally an operating radio controlled model. Scale is 1/48th. 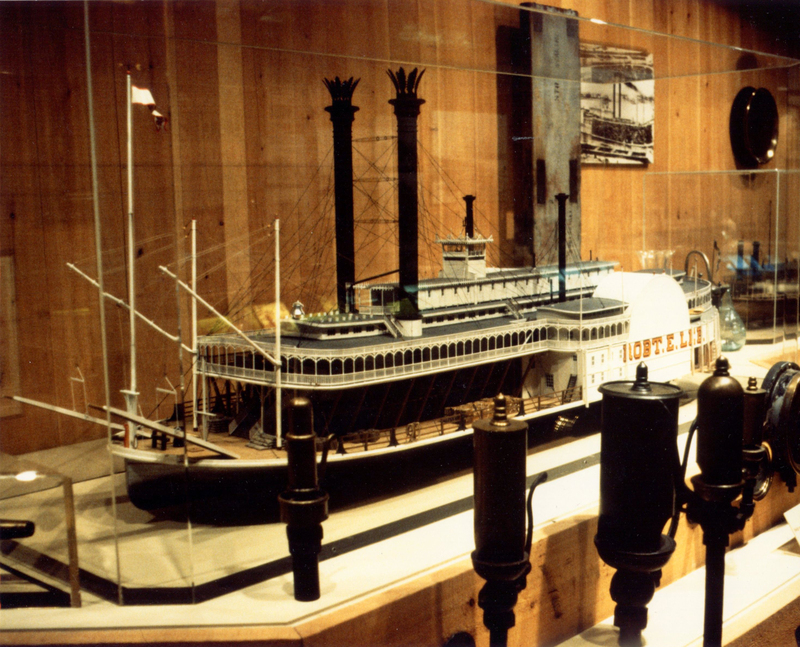 I sold it to the Smithsonian's Museum of American History in 1975 and it was displayed there until about three years ago when the museum remodeled its maritime history hall. They still own the model but it is now in storage. The black & white photo shows a younger Capt. 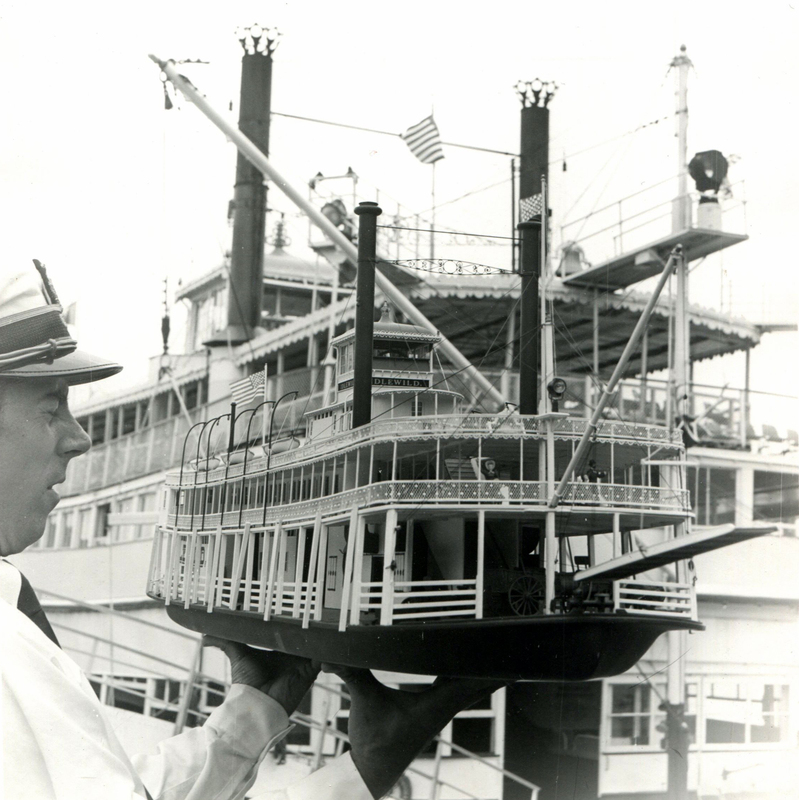 Doc Hawley holding the model with the Belle of Louisville in the background. 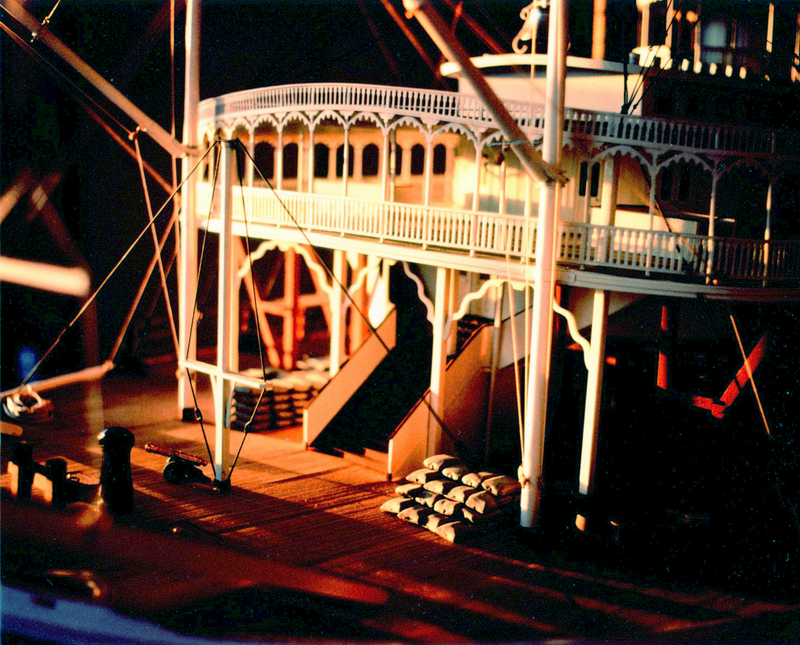 The color shot shows the model on the water in the early 1970s. The Virginia B. is my own design. 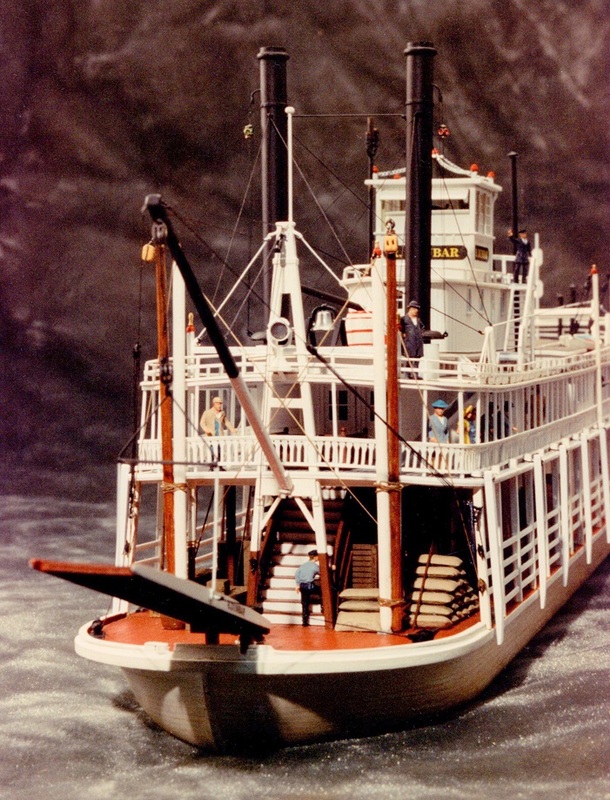 The model is designed to be a small diesel powered excursion or dinner cruise boat for river or lake service that would operate from a fixed wharf or landing - hence no landing stage (operating models with stages are clumsy to transport around). If full size she would be 107' long and 23 1/2'. beam. The model is built to 1/32 scale and is 42 in long and 9" beam. I built it about 4 years ago and this was its second (and last) trip to the Toledo RC Expo. Once you win first place you aren't allowed to bring them back. The first trip in 2009 she took a 2nd place. Between the two trips I added a few extra details and a rather spectacular LED lighting system using strip LEDs around the undersides of the decks. I'm anxious to see it on the pond at night I still need to add a few more lights to illuminate the wheel. The model is named for Virginia Bennett. She's now in her 80s and living in a rest home over in Newport KY. She used to work for the Greene Line and The DQ Steamboat Co. and is well known amongst the river people. When she was in her apartment in Ludlow KY she had a radio and communicated with all the river pilots. A navigation light has been named for her which is just below her former residence. I figured she needed to have a boat named in her honor. Editor's Note: Last year John answered my questions about his education and background for building model boats. I was trained as an artist - majored in Industrial Design. I worked or the Dept. of Defense in the Wash. DC area - civilian employee - mostly designing exhibits for the Navy - 15 years for Navy Recruiting Command - the rest of my 34 years for two different Naval research facilities. Also did illustrations, some photography and a bit of public affairs work. So even though I didn't work on the rivers, my life has still been very nautically oriented. 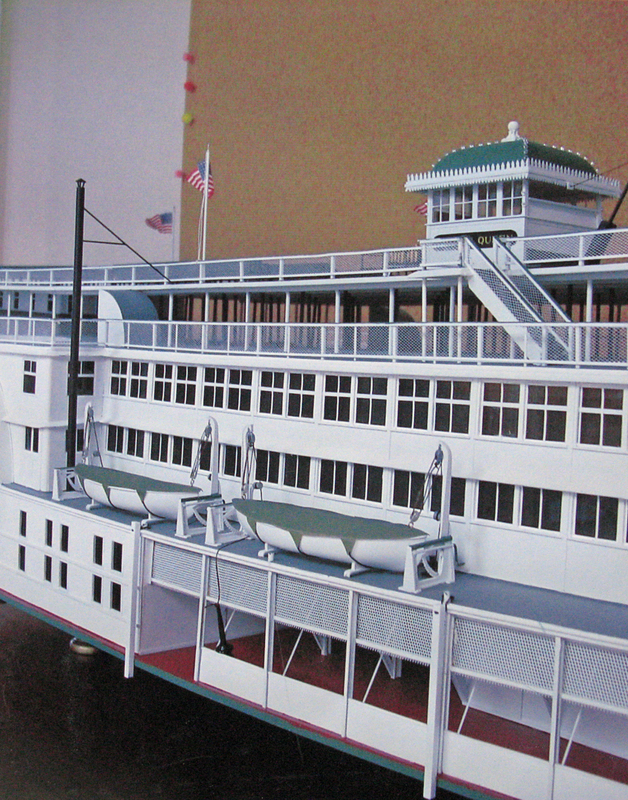 John offers a catalog of steamboat plans, click here to see Paddlewheels and Props: Plans for Riverboats and Tugs. Following is the exhibit, narrated by John Fryant. 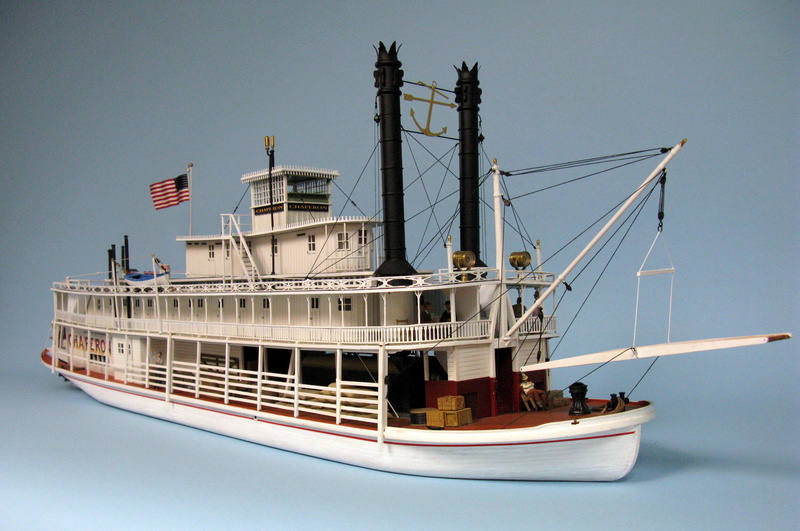 Also visit the Model boat index at Steamboats.com.